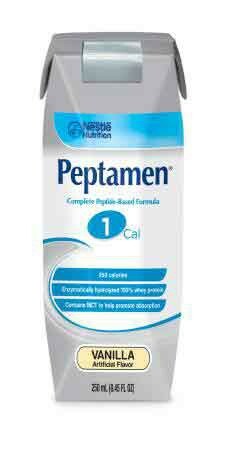 Peptamen 1.0 Cal is a liquid, isotonic-complete, elemental formula for complete or supplemental nutritional support in an easily absorbed oral form. 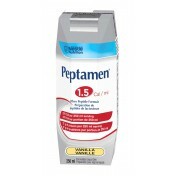 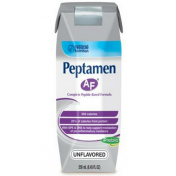 Peptamen 1.0 Cal helps patients with impaired gastrointestinal function. 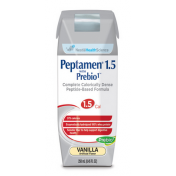 Indications for using Peptamen 1.0 Calorie may include patients with short bowel syndrome, inflammatory bowel disease, malabsorption syndromes, pancreatic insufficiency, chronic diarrhea, radiation enteritis and HIV/AIDS-related malabsorption. 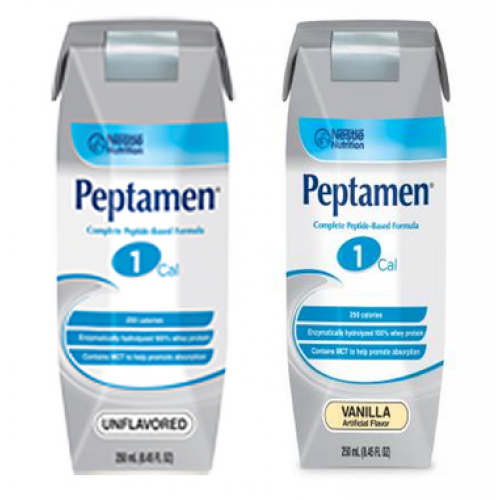 Peptamen 1.0 is appropriate for lactose intolerance, gluten-free and low-residue diets. Peptamen 1.0 Product Numbers: 9871616260, 9871616269. 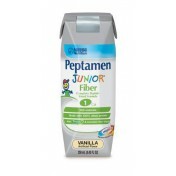 Flavor Options: Vanilla or Unflavored. 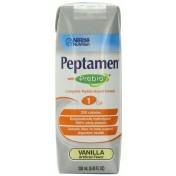 Protein Source: enzymatically hydrolyzed whey protein. 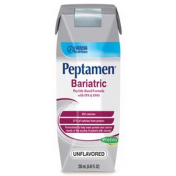 Appropriate for these diets: lactose intolerance and gluten-free. 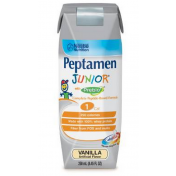 Not for individuals with galactosemia . 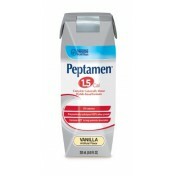 Renal Solute Load (mOsm/L): 255. 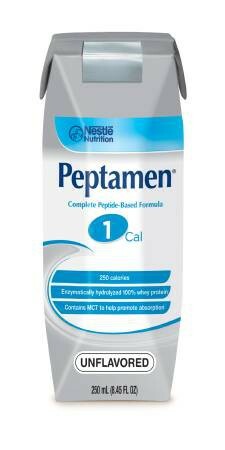 Meets or exceeds 100% RRI's for 22 key micronutrients: 1500 mL. 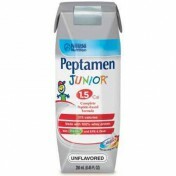 Packaging: Carton - Tetra Prisma. 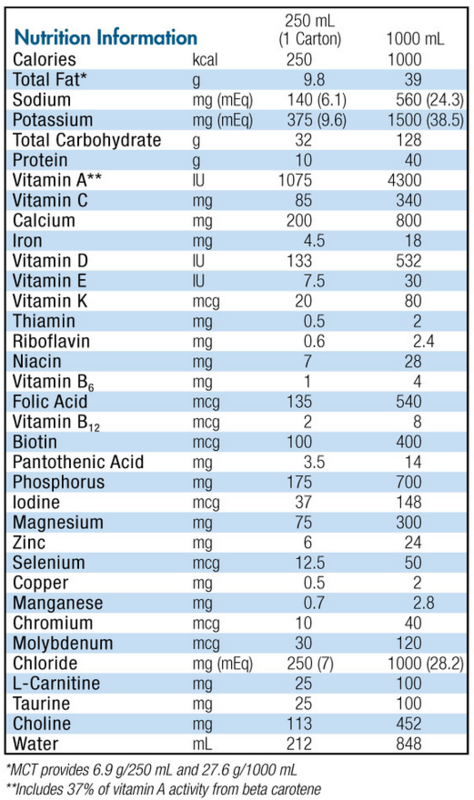 Water, Maltodextrin, Enzymatically Hydrolyzed Whey Protein (from Milk), Medium Chain Triglycerides (from Coconut and/or Palm Kernel Oil), and less than 2% of Cornstarch, Soybean Oil, Soy Lecithin, Magnesium Chloride, Calcium Phosphate, Guar Gum, Sodium Ascorbate, Potassium Citrate, Sodium Phosphate, Calcium Citrate, Choline Chloride, Potassium Chloride, Sodium Citrate, Magnesium Oxide, Taurine, L-Carnitine, Alpha-Tocopheryl Acetate, Zinc Sulfate, Ferrous Sulfate, Niacinamide, Calcium Pantothenate, Vitamin A Palmitate, Citric Acid, Manganese Sulfate, Pyridoxine Hydrochloride, Vitamin D3, Copper Sulfate, Thiamine Mononitrate, Riboflavin, Beta Carotene, Folic Acid, Biotin, Potassium Iodide, Chromium Chloride, Sodium Selenate, Sodium Molybdate, Phytonadione, Vitamin B12. Received both items promptly and very satisfied with products.